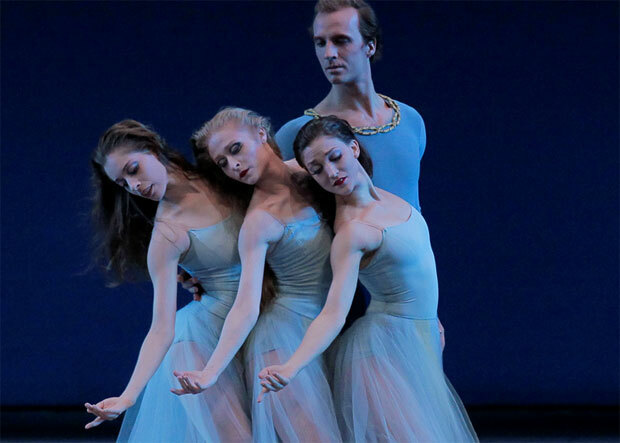 And so it was on May 1st, as the spring season opened with an all-Balanchine program. It looked good on paper – Serenade, followed by the revival of Kammermusik No. 2, and closing with the over-the-top Brahms-Schoenberg Quartet – but turned out a little lackluster, though there were certainly highs. Serenade always casts a spell, especially at the start of a season. The blue light, the diagonal rows of dancers standing reverently in their long gauzy skirts, one arm extended toward the light, the lapidary opening chords of Tchaikovsky’s Serenade for Strings in C. It is an image and a sonic environment of such weight, such stillness and strength; one would have to have a stone for a heart not to be stirred. The performance that followed, though, varied in intensity. The three soloists – Ashley Bouder, Rebecca Krohn, and Janie Taylor – are all veterans, and they all had their moments, but the mood didn’t hold. Janie Taylor, a dancer of great imagination, cast her own spell as she entered at the end of the opening section, dreamily searching for her place among the other dancers as if arriving late to a ceremonial gathering. But she looked slightly discombobulated and underpowered when it came to the actual dancing, as she does at times (she even slipped at one point). Then, when she released her great cascade of blonde hair – it seems to weigh more than the rest of her – at the end of the Russian Dance, she drew us in all over again. If only her dancing were more consistent. The other soloists were less dramatic, though Ashley Bouder danced with her usual virtuosity and brio, and her remarkable intelligence. Bouder’s dancing has intention and clarity in spades; one can see she has though about every nuance in the choreography, finding ways to emphasize this or that. In this particular performance, it was her crescendi that caught the eye; as the music grew in intensity, her steps (and jumps) expanded, in precise increments. It was remarkable. She seeks eye-contact, both with her fellow dancers and with the audience (perhaps too much with the audience) but does not always get equal engagement from her sisters onstage (with the exception of the lovely Ashley Laracey, always so alive and alert). Bouder’s fierce attack may be slightly at odds with the overall mood of Serenade, but one appreciates the effort. Rebecca Krohn, on the other hand, in the role of the Dark Angel, has a wonderful weight in her movement – and what line! – but has yet to fill out the role with her imagination. The same goes for Jonathan Stafford, who dances impeccably but with light impact. Kammermusik hasn’t been danced here since 2004, and based on last night’s performance, one can see why. This 1978 work is set to a thorny piano concerto by Paul Hindemith (composed in 1924) that sounds like what you might get if you crossed Stravinsky with Shostakovich. It’s not easy to absorb, and, on first viewing, seems to suffer from an overload of invention coupled with a lack of momentum (highly atypical for Balanchine). It never quite gets off the ground, though the movements are constantly original, surprising, playful. Its closest relative in the Balanchine canon is perhaps Rubies – sporty, jaunty, sassy – but without the freshness or the sense of context. The distribution of the cast, too, is unique: two female soloists (Sara Mearns and Teresa Reichlen), later joined by two partners (Jared Angle and Amar Ramasar), plus an all-male ensemble. After a lively opening section, in which Reichlen and Sara cavort side by side, skipping, jumping with flexed feet, swiveling their hips, and pointing their fingers in different directions as if directing traffic, the male corps takes center stage, creating a complex, asymmetrical grid across the stage that morphs into different shapes. A man breaks free, diving into a deep lunge, chest almost touching the ground. The male ensemble constantly comments on the action with all manner of odd poses, including one section in which the dancers seem to be miming horseback riding, and another in which they prance about on their toes with strange chicken-wing arms. Is it meant to be funny? Most likely. The partnering is also intentionally eccentric, as when Angle assists Teresa in a hopping circle, or Ramasar pokes his arms into the spaces between Mearns’s arms and her head. But, unlike works like Agon or Symphony in Three Movmeents, the eccentricity doesn’t seem to have any point. Then, a tender touch: Mearns repeatedly pulls Ramasar’s hand to her cheek, as if seeking affection (it must be said, the two of them have a real chemistry). But it doesn’t quite convince. Perhaps it will cohere with further performances. Brahms-Schoenberg Quartet lives or dies by the quality of the individual performances in each section; it takes dancers of great charisma to carry off the beribboned grandeur, the kitschy pink Austro-Hungarian ambiance, the swashbuckling, boot-tapping panache. The energy at this performance ebbed and flowed, with a rather pedestrian opening illuminated by a soulful solo turn by Megan LeCrone which greatly outshone the leading couple. LeCrone is regal with dark undertones, and her long, lean lines and sense of sweep really ride the wave of the music. The pas de deux in the Andante, danced by Megan Fairchild and Andrew Veyette, was pretty but too prim; Fairchild is no prima donna, and big opulent roles don’t suit her at all. However, when a little martial tune surfaced in the music, with its snare drums and marching rhythms, she was suddenly in her element, kicking and jumping with a glint in her eye. Veyette erupted across the stage with great élan in the virtuosic male solo, also set to this martial passage. (Also in the Andante, Ashley Laracey – a member of the corps – was again remarkable for her poetry and poignant lyricism. Laracey always seems to dance as if in a trance, lost in the music and the drama around her.) The much-loved closing number, the Rondo alla Zingarese – all ribbons, boots, and swishing skirts – was danced by Maria Kowroski and Tyler Angle But it never got off the ground; Kowroski lagged behind the beat and lacked vigor. Angle did his best to liven things up, but it takes two to make this gypsy dance sizzle. The high point of the evening was the pas de deux in the Intermezzo, with its swooping lifts: the man raises the ballerina up above him, and then, just as dramatically, pulls her down, almost under his body. Robert Fairchild and Sterling Hyltin were sensational; Fairchild grabbed Hyltin with an ardent, almost violent grip, full of desire. His partnering was masterful, with an edge of recklessness, and Hyltin was game. Sensually, and with abandon, she allowed herself to be carried by his ardor, no matter how off-balance her positions or how unexpected his timing. Her feet barely touched the ground. There was something almost illicit-feeling about watching the two of them dance together. The audience erupted in applause. Let’s hope the rest of the season brings more dancing like this.